Will we see you at SEMICON China 2019? SEMICON China 2019 is fast approaching and we will be there! You can read about it now in English or below in Simplified Chinese! Shanghai is the best place to be March 20 – 22 as it welcomes SEMICON China, Productronica China and more this year in the Shanghai New International Expo Centre. Cimetrix will be attending SEMICON China for our fourth straight year and we hope to see many of you there! Please drop by booth #N4- 4284 any time during the expo! 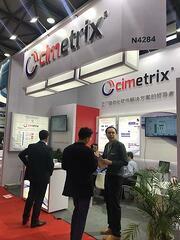 China is a growing market for the industry and for Cimetrix! We have expanded our office to better serve our customers as we expand throughout the region and we believe SEMICON China is the perfect place to come together with our current customers and many of the industry leaders. The main focus of SEMICON China is to further the development of the China semiconductor and related emerging industries. You will see high-level executives from the semiconductor industry and others showcase their products and give presentations during this three-day show. As we prepare for the show, we welcome any meeting requests by clicking the button below. Or you can always drop by our booth at any time. We hope to meet you there! SEMICON Korea 2019 is Coming up Next Week! Read now in Korean or below in English. 씨메트릭스는 이번 2019 년 SEMICON Korea전시회에서 귀사와 만날 수 있기를 바랍니다! 올해 우리는 부스 # C818에서 우리의 파트너인 링크제니시스와 공동으로 전시합니다. 전시회는 1 월 23 일부터 25 일까지 서울 코엑스에서 개최됩니다. 씨메트릭스는 장비 자동화와 통신 소프트웨어 관련 최고 기업으로서 한국뿐 아니라 글로벌 시장에서 동반자로 같이 일할 수 있는 여러분들을 만나고자 합니다.SEMICON Korea는 1987 년에 시작되어 대한민국의 반도체 산업가 그 성장을 같이 해왔습니다. 이번 전시회에서도 반도체 소재 및 장비의 모든 최신 기술을 선보일 예정입니다. 특별 프로그램 중에는 인공 지능 정상 회의 (AI Summit), AI 관련 새로이 창출된 기회를 진단해 볼 수 있는 자리와 반도체 업계 입장에서 인공 지능과 자동차의 부상에 따르는 시장을 이해하는 데 도움이되는 세미나, 차세대 혁신가들을 끌어 들이기위한 Workforce Development Seminar등이 있습니다. Smart Manufacturing 포럼은 우리 업계에 일어나고 있는 큰 변화와 커다란 기회에 대하여 모두가 함께 일하면서 무엇이 효과적이며 다음에 필요한 것이 무엇인지를 논할 예정이여서 많은 분들에게 인기가 있을 것으로 예상합니다. 씨메트릭스 제품이 여러분의 현안뿐 아니라 미래의 전략이나 Smart Manufacturing이라는 목표에 어떻게 도움이 될 수 있는지 자세히 알고 싶으시다면 전시회 기간 중 C818 부스를 방문하여 주시기 바랍니다. 웹 사이트를 통하여 언제든지 회의를 요청하실 수도 있습니다. 전시자에서 곧 봽기를 기대합니다! Cimetrix is heading to the 2019 SEMICON Korea show next week, and we hope to see many of you there! This year we are co-exhibiting with our partner Linkgenesis at booth #C818. The show will be at COEX in Seoul from January 23 – 25. We look forward to meeting with clients, prospects and colleagues to discuss new opportunities. SEMICON Korea launched in 1987 and has been bolstered by the growing semiconductor industry in Korea. This exhibition will showcase all the latest technology in semiconductor materials and equipment. Some of the special programs include an AI Summit, examining new opportunities with AI implications, a Market Seminar to aid in understanding the rise of AI and automotive in the industry, and a Workforce Development Seminar, aimed at drawing the next generation of innovators to the industry. A Smart Manufacturing forum is going to be popular as there are big changes and big opportunities for our industry as we work together to share what’s working and what is needed next. If you would like to learn more about how Cimetrix products can help with your Smart Equipment and Smart Factory goals, please stop by booth #C818 during the show. You can also request a meeting any time on our website. We look forward to seeing you there! Cimetrix is gearing up for the 2018 SEMICON Japan show next week! シンメトリックスは、来週開催されるセミコンジャパン2018に向け、準備を進めています。今年も皆様にお会いできることを、楽しみにしております。Read now in Japanese or below in English. Cimetrix is gearing up for the 2018 SEMICON Japan show next week, and we hope to see many of you there! This year we will have a booth in the Smart Manufacturing Area (#3493) and we will also be co-exhibiting with Rorze (#5507) and Meiden (#4626) who have been our long-time distributors. We look forward to meeting with clients, prospects and colleagues to discuss new opportunities. The theme that SEMICON Japan has chosen for 2018 is “Dreams that Fuel Growth and Prosperity Start Here”. Japan supplies one third of the semiconductor manufacturing equipment and more than half of all the materials used by the global semiconductor manufacturing industry. As a result, SEMICON Japan is a great event to make connections with both the Japanese and global electronics manufacturing supply chain companies. SEMICON Japan will feature several innovative areas including the SMART Applications Zone, which will connect SMART industries with the semiconductor supply chain, and an Innovation Village which is a place to showcase startups in this industry. There will also be several pavilions that generate a global networking energy and foster excitement for the show. If you would like to learn more about how Cimetrix products can help with your Smart Manufacturing goals, please stop by during the show. You can also request a meeting any time on our website. We look forward to seeing you there! 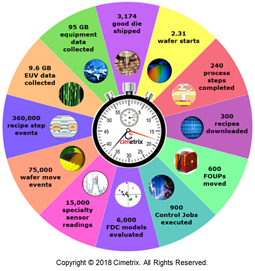 Starting at 1:00 o’clock on the infographic and moving clockwise, you first notice that 2.31 wafers enter the line. Of course, these are actually released in 25-wafer 300mm FOUPs (Front-Opening Unified Pod), but 100K wafers per month translates to 2.31 per minute. Since these factories run continuously, once the line is full, it stays full. 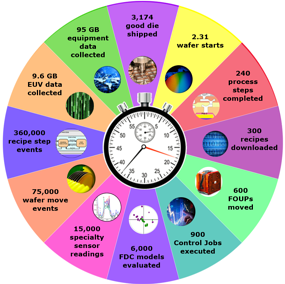 And with an average total cycle time of 4 months, this means that there are 400K wafers of WIP (work in process) in the factory at any given time. This number, and the total number of equipment (5000+), drive the rest of the calculations. 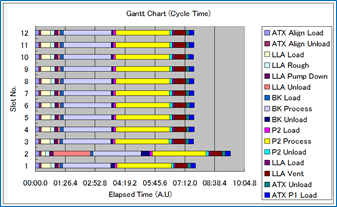 You can see this infographic and much more in the Cimetrix Resource center. During the SEMICON West exhibition in San Francisco this past week (July 9-10), the North American Information & Control Committee and its Task Forces met to continue SEMI standards development. Here is a brief summary of the proceedings. The GEM 300 task force, in addition to reapproving E90, also approved minor title changes to the E39, E39.1, E40 and E40.1 standards. Each SEMI standard must be revised or reapproved to avoid becoming inactive. A few years ago, SEMI changed regulations that mandate that each standard declare its classification, such as a “guide” or “specification”. Since then the task force has been slowly correcting the titles. The E37.1 standard is in the middle of such classification, but has been riddled with reapproval complications due to minor concerns and some needed corrections in the standard. The ballot to make these corrections, 6349, failed for the second time at SEMICON West. The ballot will be slightly reworked and resubmitted for another round of voting. Another ballot, 6348 proposed to clean up the GEM E30 standard, to improve its readability and to bring the standard in conformance with current SEMI regulations and its current style guide. The forefront of the discussions was surrounding the confusing use of acronyms DVNAME, DVVAL, SVV and other such acronyms where the meaning and use of the acronyms was confusing to new readers. The 6348 ballot also failed, but hopefully the task force is progressing towards reaching an agreement. One major challenge is that ballot 6348 is a major revision ballot, where the entire specification is opened up for review and scrutiny, as opposed to line item ballots where only specific sections of a standard are modified. Finally, and most exciting is ballot 6114B; a revision to the SECS-II E5 standard. The ballot proposed a set of new messages for transferring any large items between a host and equipment. Typically, one item in a message is limited to about 16.7 MB. The new messages are specifically targeting the transfer of equipment recipes, but the messages are written generic enough so that anything else can be transferred, too. The new messages support two styles of item transfer. Either the item can be transmitted in a single message, or broken into parts for transfer with the expectation to be concatenated by the recipient. Or the item can be transmitted in multiple messages, broken into parts with each part sent in a separate message and the same expectation to be concatenated by the recipient. An item is identified by its “type”, “id” and “version”. The messages are intended to resolve current issues with recipes where some equipment suppliers are using recipes that surpass 16.7 MB. And the messages open the door to be used by other SEMI standards and to be customized for specific applications. After passing this ballot, the task force intends to make the messages part of the GEM standard. Even though the ballot 6348 failed, the task force seems to have finally reached consensus on the message formats and continues to work out minor details. The DDA Task Force continues to work on the next version of the Equipment Data Acquisition (EDA) standards. In the latest cycle of voting, changes were proposed to E138 (ballot 6336), E134 (ballot 6335) and E132 (ballot 6337). Although one part of E134 passed, most of E134 failed and the other ballots failed. All of the failed ballots will be reworked and resubmitted for voting. Additionally, during the task force meeting additional proposed changes were reviewed and discussed. 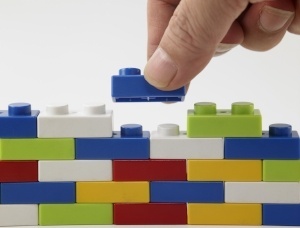 The task force continues to make plans to move from HTTP 1.1 and SOAP/XML to HTTP 2.0 and Protocol Buffers. Specifically, the plan is to recommend using gRPC. Testing done to date indicated an 18 times performance improvement and significant bandwidth reduction. The task force also discussed changes to simplify the equipment model metadata handling. 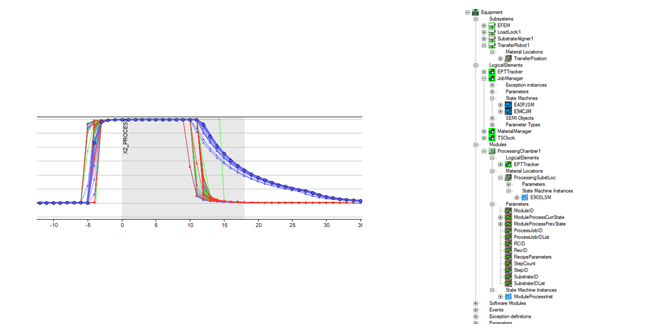 Finally, Cimetrix proposed the implementation of a new method of data sampling designed for higher data collection frequencies. The current trace data collection messages, while very effective for speeds up to maybe 80 Hz, become inefficient when trying to collect data at even faster rates. The concept is called a “cached data sample” where the equipment collects the data at a specified frequency and then reports the data in an array syntax. When using HTTP 2.0 and Protocol Buffers, this will be an especially efficient format expected to allow much higher frequencies. The client specifies the data collection frequency as well as the reporting frequency. For example, a client might specify a frequency of 10 kHz and a reporting frequency of 1 s, where 10,000 data samples would be reported each second. Such proposal if accepted, combined with the faster Protocol Buffer, will open the door for a number of new data collection applications. A lot of people are wondering when EDA freeze III will be done. Probably not until late next year. How soon this happens mostly depends on how efficiently task force members provide feedback on the ballot drafts. Subscribe to our blog in the upper right corner of this page to be sure not to miss that or any of my future updates on the North American Information & Control Committee. Cimetrix is here at SEMICON West 2018 and we're excited to be a part of the first Smart Manufacturing Pavilion in the South Hall. 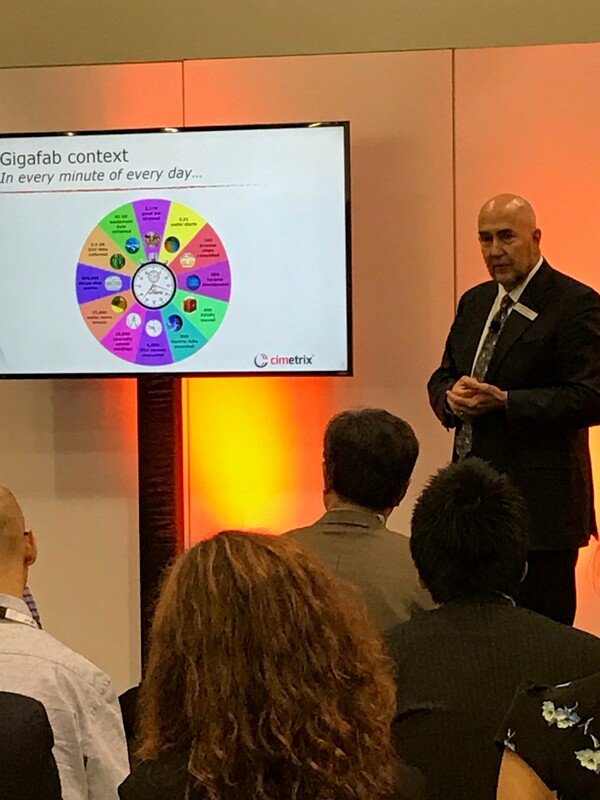 We hope you've been able to drop by and hear some of the great speeches including our own experts Alan Weber, VP New Product Innovations and our VP & GM Smart Factory Business Ranjan Chatterjee with Dan Gamota (VP Digital Engineering Services) at Jabil. Alan Weber's presentation is now available online. The topic he chose is "Making Smart Manufacturing Work: The Stakeholder-driven Requirements Development Process". An important maxim of performance management is “You get what you measure.” This is largely true whether you are talking about employees, organizations, processes, time management, sports teams, or – to highlight a current global industry topic – Smart Manufacturing. The question now becomes “How DO the industry’s leading manufacturers ensure the equipment they buy will support their Smart Manufacturing objectives?” This presentation explains how the careabouts of key stakeholder groups are “translated” into specific equipment automation and communications interface requirements which can then be directly included in the equipment purchasing specifications. As more semiconductor manufacturing companies take this approach, effectively “raising the bar” for the entire industry, the collective capability of the equipment suppliers will increase in response, to everyone’s benefit. Through several interviews with leading manufacturers over the past 18 months, we discovered that the best way to accomplish this is through a focused, interactive questionnaire process. By asking very specific questions about people’s daily tasks, problem areas, expectations, success criteria, and other items of constant concern, we can take a generic automation purchase specification outline and generate a complete, factory-specific set of automation and communications interface purchase specifications in a matter of days. This is time well-spent when you consider the value and volume of equipment potentially affected… and the opportunity cost of not having these requirements clearly expressed. If the above discussion triggers the question “I wonder if our equipment automation purchase specs are sufficient to address the Smart Manufacturing challenges we’ll face in the next few years?” this presentation will interest you. Taking its lessons to heart may be the most important next step you take in formulating you own company’s Smart Manufacturing implementation roadmap. Get Alan Weber's SEMICON West presentation now! SEMICON West 2018 is fast approaching and the Cimetrix team is gearing up for a great show. The show runs from July 10th – 12th at the Moscone Center in San Francisco and we’re looking forward to meeting with all our present and future clients. This year SEMICON West is unveiling the new Smart Manufacturing Pavilion to showcase the entire manufacturing process from silicon to systems, including Front End, Back End and PCB Assembly. Cimetrix is excited to announce that we are a sponsor and will be participating in the Smart Manufacturing Pavilion showcase, both as part of the Front End segment as well as in the PCB Assembly area. The Smart Manufacturing Pavilion includes a “Meet the Experts Theater” featuring presentations from two of our own Cimetrix thought leaders. Alan Weber will present “Making Smart Manufacturing Work: The Stakeholder-driven Requirements Development Process” on Wednesday, July 11th at 11:00 am. This process has already been used successfully to support the significant growth of SEMI EDA standards usage in Asia, but is equally relevant for a wide range of related Smart Manufacturing technologies. Cimetrix will be exhibiting at booth #1122 in the South Hall, just a short walk from the Smart Manufacturing Pavilion. Stop by our booth or find us at the Pavilion to talk to our experts about your specific needs. We will have onsite product demonstrations as well as information about our company available. You can also schedule in advance a time to meet with us at the show by filling out a quick form with your meeting request.